Last week, Miley Cyrus told talk-show host Ellen DeGeneres that she doesn’t like wearing her engagement ring because it’s not her style. 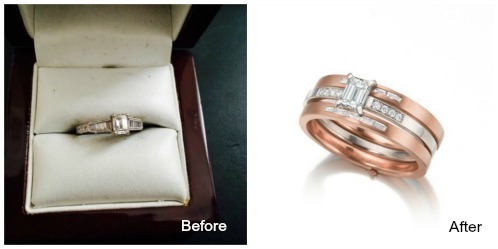 One of my specialties is redesigning old or unloved jewelry, including engagement rings. I’m also a long-time supporter of Miley, so I’d be perfect for the job. 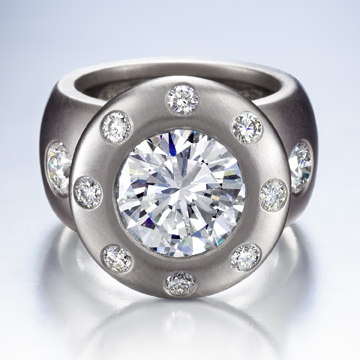 One of my recent engagement ring redesigns. Click for original post. Clearly, Miley isn’t fretting that fiancé Liam Hemsworth’s self-esteem is based on her enthusiasm for his ring, because she announced her feelings on national television. But I doubt he was surprised if she wasn’t wearing it often. My very first engagement-ring redesign was a situation like that. Judy — who preferred bold accessories — hadn’t worn her petite ring since her wedding, and it’s not like her husband didn’t notice that. But then we come to the second reason people don’t consider redesigns: They don’t know it’s possible! When I met Judy and her husband, they realized it could happen. They were thrilled with the outcome. Judy’s ring. Before on the left. After on the right. Click for original post. I’ve done my best to make people aware of this option, and it looks like I’m having some success. In Yahoo’s story on Miley’s ring, I was mentioned as a go-to person for redesigns. CLICK HERE TO READ THE YAHOO ARTICLE. But if that’s not what has happened, I’m your redesign woman. Tell me your budget and I’ll tell you what I can do for you. As far as aesthetics, I’m happy to do a simple solitaire, but I’m even happier to go wild. 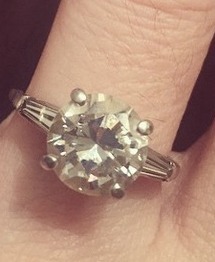 Remember my mom’s original engagement ring? I turned it into this award-winning 50th-anniversary extravaganza. So if Miley wants an engagement ring that reminds her of gummy bears or unicorns, I would be happy to create that for her. MILEY, CALL ME! 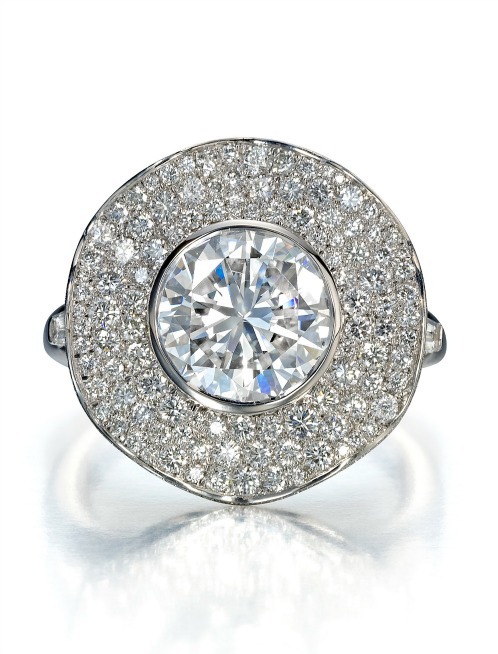 Of course, you don’t have to be a celebrity to get a jewelry redesign from me. If you’re interested, holla at me at info at wendybrandes dot com and we’ll talk. Thinking about Miley’s ring got me musing over my own ring redesign. 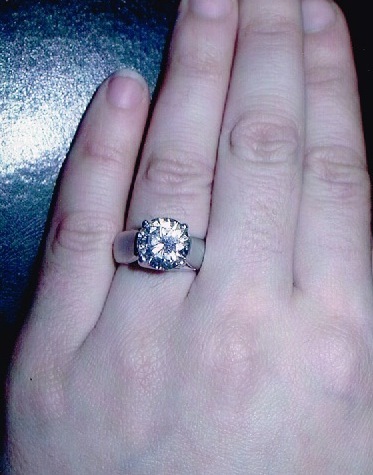 I originally designed my engagement ring in 2001 — before I was in the jewelry business. I let myself get talked out of what I really wanted to do because, supposedly, I would get tired of something that was too untraditional. The first version of my ring. Click for original post. What is interesting is that my style has changed so much as a jewelry designer. I started out with bold, abstract, but fairly simple designs like my engagement ring. I’ve evolved into incredibly intricate, figurative work as seen in my Maneater collection. I’ve realized that if I were to do the redesign of my own ring now, it would be more like the Maneaters than what I did a decade ago, just because that’s the style I lean towards for my own inventory these days. But that fact doesn’t lessen my satisfaction with my engagement ring as it is now. I’ve always had eclectic taste! I’m glad it worked out like it did. Your redesigns are fantastic — hard to believe how they all started out (so boring). I don’t think I ever saw that stacked ring, it’s so cool!